“What Independence Day should mean for me?” a little school going girl eagerly asked her granddad! Her granddad asked her why is she asking such question. “Well, darling, you need to understand the essence of Independence Day.” replied her grandfather. For many of us, it may seem forced patriotism when it comes to celebrating Independence Day. We often look it as an excuse to get a leave, relax the entire day, have some good food and feel sorted! Do we really understand the significance of Independence Day? It’s not really possible to ‘feel’ what Indians felt when they were tortured by Britishers. It’s impossible to feel the pain and struggles of our freedom fighters. But we Innofieders did our part to pay homage, respect, and love to everyone who sacrificed their lives to bring freedom at the eve of 71st Independence Day (without cutting down the fun)! When Innofieders Took The Charge! 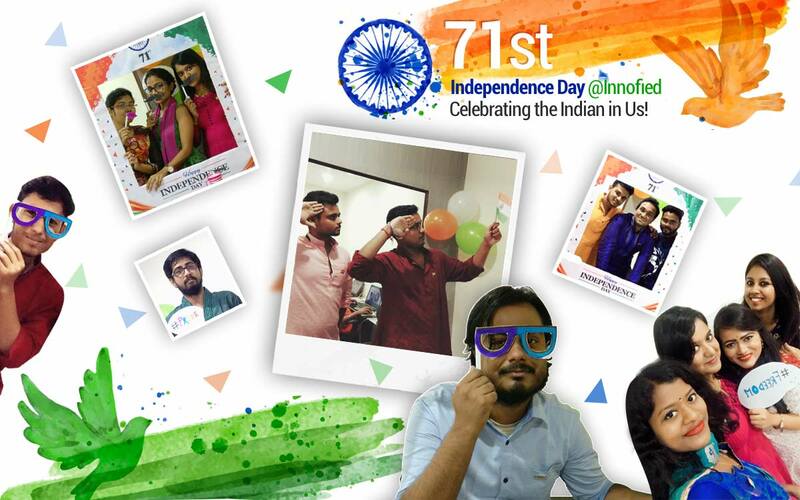 The celebration started off with vibes of Independence Day with decorating our work place. The theme was fun to match the colours of independence. We organized a Selfie Contest! With the photo booth ready with freakish props, Innofieders got ramped up for any challenge. It was the time to reminisce the journey of freedom fighters who gifted our independence from the clutches of British. We started off by singing our National Anthem to celebrate the Independence Day of India. After that, Nidhi Jaiswal took the stage to sing “Mera Rang De Basanti Chola…”. Then we had our storyteller-actor-coder Rahul Karmakar on narrated us a story about how a small message on equality changed the life of a school kid. Next on stage was Dipanjan Chakraborty who recited a spell bounding ‘Ami Subhas Bolchi’ by Subho Dasgupta. We loved every bit of it. Now it was time to hear from our magical fingers of Innofied, Tamodeep Das, our musical maestro, playing a Vande Mataram Mashup. The performance mesmerized all of us with our hearts beating with PRIDE. Tamodeep Das playing Vande Mataram Mashup! We ended our cultural event with a fun filled song “Roo ba roo” by Aritra Chattopadhyay, hidden talent of the Sales and Marketing squad! And everyone joined! The day ended with the pledge to create a new India where everyone gets the freedom to live in well being and peace. We look forward to another gala celebration next year!